Paris is always a good idea: meet us at Paris Fintech Forum (PFF), the single most exclusive European event on digital finance, on 29-30 January! Join more than 2,500 participants, including finance and insurance experts, bankers and regulators, and over 200 C-level speakers from across the globe to catch up on all things fintech at 150+ keynotes, panels, interviews and pitches. Rub shoulders with industry bigwigs such as Nordea Bank, Revolut, N26, Transferwise, Amazon Pay and Google, as well as 150+ companies shaping the future of finance. 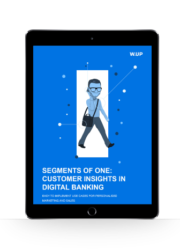 Interested in how to turn data into better banking experiences and more digital sales? Make sure to say hello to our International Sales Director, Tamás Braun, our Head of Alliances, Remco Veenenberg, and our President, Balázs Vinnai. If you would like to schedule a meeting with us, drop us an email to [email protected].